The Visakhapatnam Port Trust (VPT), India, is ready to expand its container terminal, informs The Hindu. The project involves an investment of INR 633 crore (apprx. USD 90 mln) and is expected to commence by the year end or early 2019. The Visakhapatnam Port, which is located on India’s east coast in between Chennai and Kolkata, plays a vital role of one of the nation’s major ports. Visakha Container Terminal Pvt. Ltd. (VCTPL) was built as a BOT terminal in 2003. VCTPL is the operator for the project and is formed as a joint venture of United Liner Agency (a part of J.M. Baxi Group) and Dubai Ports International. 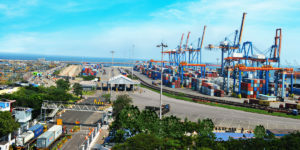 Although the Visakhapatnam Port signed the concession agreement with the VCTPL on 17 December 2015, the grounding of the project took a long time due to the issues pertaining to road connectivity, as well as prolonged recession, among other factors. VCTPL has committed a 11.04% gross revenue share of VPT. Now that VPT has prepared the blueprint to become a world-class port, it is set to raise the green flag for the expansion of Visakha container terminal as one of its most ambitious projects. As soon as the Board approves the project, the Letter of Concession will be issued, the VPT officials say. “The project is likely to take off very shortly and it is one of the prestigious projects undertaken by the port,” VPT Deputy Chairman P.L. Haranadh says. With its strategic location close to Malacca Strait and wide hinterland, the project is seen as an ideal gateway for container traffic. The port has a natural depth of 16.5m, quay length of 450m and channel width of 220m. VCTPL intends to increase its current handling capacity of 0.5 mln TEU per year up to 2 mln TEU by 2020. The facility has modern infrastructure including post-Panamax STS cranes, over 350 reefer plugs and an excellent rail connection. Industry sources say that as the Cabotage law has been relaxed, VCTPL has a potential to emerge as a regional transhipment hub with main liner such as Maersk operating dedicated service connecting the Visakhapatnam Port to the Middle East and other international destinations. In May this year, the Union Shipping Ministry issued a notification lifting the curbs on foreign registered vessels on transportation of loaded or empty containers between Indian ports. Earlier, it was the prerogative of Indian registered shipping lines.